It's easy if you're looking for a new full-size, light-duty pickup to just go straight to the 2017 Ford F-150. After all, it surely can't be America's biggest-selling vehicle of for nothing, can it? Well, if things really were as straightforward as that, other manufacturers wouldn't sell as many of their models as they undeniably do, and plenty of consumers do go for trucks other than the F-150. So, let's compare Ford vs GMC by doing a 2017 Ford F-150 vs 2017 GMC Sierra 1500 comparison to see which truck is better. Only a foreign or a very brave domestic manufacturer would stray too far from the generally accepted formula for the way full-size pickups have to look. The 2017 Ford F-150 fits the classic truck blueprint perfectly, and its big, blocky dimensions and extremely flat panels are just what we expect, and like to see. Reassuring rectangles are definitely favored over seductive curves all day long here. The undeniably chunky and macho 2017 GMC Sierra 1500 also checks all the styling boxes for a domestic full-size, light-duty pickup truck. Last year, the Sierra was given a bolder grille and all models received at least some form of LED lighting, and the 1500 can be as blingy or as subdued as you want. The opening round of the F-150 vs Sierra 1500 has to be a tie. Looks are important, but the majority of truck buyers will be more concerned with capability than how a truck looks. Obviously, the payload and tow ratings are the two main measures of capability, and the 2017 F-150 is capable of hauling as much as 3,270 pounds and the maximum tow rating for the Ford is an impressive 12,200 pounds. The most a 2017 GMC Sierra 1500 is capable of hauling is just 2,250 pounds, but the maximum towing capacity is more than a match for the F-150 at an impressive 12,500 pounds. Despite that small amount of extra towing capability, the Ford is the winner because it can haul so much more than the Sierra. The latest F-150 really does well in this area with its concentration on efficiency resulting in best EPA-estimated ratings of 19 mpg in the city, 26 mpg on the highway, and 22 mpg combined, although you can achieve much less if you try hard enough. The Sierra doesn't come in a long way short of the F-150 for fuel-economy, but its best ratings of 18 mpg in the city, 24 mpg on the highway and 20 mpg combined are low enough to hand another victory to the Ford. 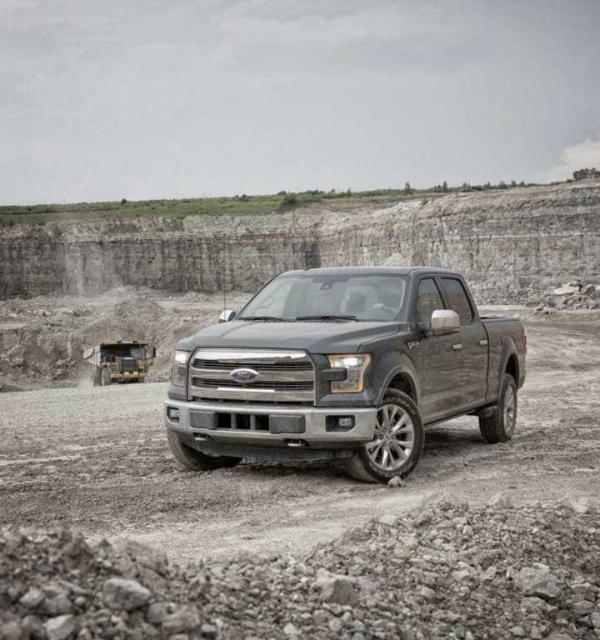 With four engines, and more trims levels, bed lengths, body styles and drivetrain options than you can imagine with the F-150, there's really no such thing as a standard F-150. But the entry level XL is relatively workmanlike with just the basics of air-conditioning, an automatic transmission, a stereo and a tilt/telescoping steering wheel. Beyond there though, the sky really is the limit. Even base versions of the Sierra get air conditioning, keyless entry, a locking tailgate, a rear bumper with integrated steps, and a choice of vinyl or cloth upholstery. But as base regular cab models don’t get the 4.2-inch color display, this has to be another area where the F-150 is superior. There's no getting away from the fact the GMC Sierra 1500 is a very good truck, and the opulent Denali trim really is something pretty special. However, the 2017 F-150 has its GMC rival beat by most measures, and the Ford even costs less too, just to rub a little salt into the wound. For more information and to schedule a test drive in the 2017 Ford F-150, get in touch with us here at Southern California Ford Dealers today.